Situated in south-central Africa, Zimbabwe is a land-locked country covering an area of 391000km2, comprising mostly plateau land ranging from 600 to 1 300m above MSL. The high veld, which runs from the southwest to the northeast, is about 650 km long and 80 km wide and ranges from 1200 to 1 500m above MSL. In the east it culminates in high mountains forming a natural border with Mozambique. On the northwestern side of the plateau, the slopes lead to the arid Limpopo and Sabi basins. The highest peak is Mount Inyangani (2592m above MSL). The gently undulating landscapes of Zimbabwe are sometimes punctuated by rugged bornharts and kopjes. The eastern highlands are marked by round topped hills, as opposed to the steep slopes of the Zambezi escarpment. The rock crystals of Zimbabwe are extraordinarily ancient, dating back 3800 million years. Most of the present day rock formations comprise igneous intrusions into the cratons. Volcanic intrusions that occurred along a 430-km-long crack in the craton across the country have resulted in the formation of gabbros and the mineral-rich peridotites of the Great Dyke. The Zambezi valley and a vast area south of Lake Kariba are covered with sedimentary rocks, while the exposed Jurassic lavas form the rocks of the extreme northwest and the southeast. The northwestern parts of Zimbabwe are covered with Kalahari sands. The climate of Zimbabwe is moderated by the high altitude, proximity to maritime influence from the Mozambique Channel, influence of the mid-continental high pressure (the Botswana upper high) and the volatile, warm, moist conditions of the intertropical convergence zone. Three distinct seasons are discernible. The hot-dry season, which begins in mid-September and lasts up to January, is followed by a warm-to-hot wet season characterized by thunderstorms from the onset of the rains until March-April. The cool-to-warm dry season, marked by warm sunny days, cool nights and high evapo-transpiration, lasts from April to September. Humidity (20% in September to an uncomfortable 80% in January) depends mainly on the season and the time of day. In most places the air temperature varies within the temperate/sub-tropical range of 10° to 28°C. The climatic comfort is generally optimum in most parts of the country, except during the month of October which is extremely hot but not so in the eastern highlands. However, people living in the lowlands of the Zambezi and Limpopo valleys endure prolonged heat stress. Regosols, lithosols, vertisols, siallitic, ferric-siallitic, paraferrallitic, orthoferrallitic and sodic are the eight main soil types of the country. There are, however, localized patches of alluvial and colluvial soils mainly in the Zambezi valley. Most rivers in Zimbabwe retain water only during the wet months and only the Zambezi retains a significant dry weather flow. The high plateau land running diagonally across the country from Plumtree towards the northeast forms the major watershed of Zimbabwe. The northern part of the country is drained by the Zambezi River and the southern part by the Save/Runde, Limpopo, Nata, Buzi and Pungwe river systems (see Figure 1). 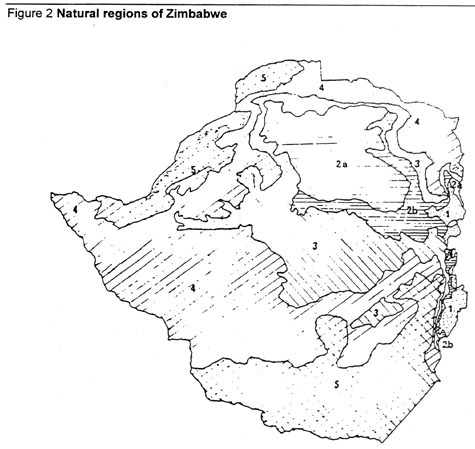 The country is divided into five natural regions (see Figure 2). High rainfall (900 to 1000 mm/yr), specialized, diversified farming. (a) Moderately high rainfall (750 to 1000 mm/yr), confined to summer months. Intensified farming region. (b) Same as (a). More severe dry spells during rainy season or relatively short rainy seasons. Moderate rainfall (650 to 800 mm/yr), semi-intensive farming. Fairly low rainfall (450 to 600 mm/yr), semi-intensive farming. Low and erratic rainfall (less than 650 mm/yr), extensive farming. The population of Zimbabwe was 10401767 in July 1992. At a growth rate of 3.1%, the current population is estimated at 11 million, of which 23% is concentrated in the urban areas. Agriculture forms the mainstay of the economy; marketed farm output amounts to 20% of the gross domestic product. About 75% of the population is directly dependent on the land and agriculture farms. Agriculture provides 40% of the inputs to the manufacturing sector and contributes 50% to exports. Zimbabwe's well-developed manufacturing sector produces more than 6 000 products including finished and capital goods for the home and export markets. Animal husbandry, forestry and mining are the other major sectors of the economy. Five major land use types exist in Zimbabwe, i.e. communal lands (42%), commercial farming areas (36.2%), resettlement areas (6.8%), parks and state forests (14.4%), and urban and others (0.6%). The communal lands comprise former tribal trust lands. The resettlement areas were introduced after independence in 1980 in response to increasing pressure from the population in the communal lands and to solve the problem of landlessness, especially for households that were displaced during the war for national independence. The main differences between the communal and commercial farm lands are in the tenure systems, land management, and the size of farm land owned by individual farm households. Communal areas are occupied by peasant farmers who cultivate smallholdings (approximately 2.5 ha) allocated by the community leaders. Ultimate ownership of land in such areas is vested by the community on behalf of the state. Commercial farmers own their land of various sizes up to 2500 ha. While the peasants of communal areas till the land and raise livestock for subsistence, the landlords of commercial farms market their entire huge produce. This distortion in the land tenure system and the inequitable use of natural resources have a bearing on the nation-building activities and the socio-economic reforms being pursued by the young nation. Between 1980 and 1989, the government acquired 3.3 millionha of land from the commercial farming sector for the land resettlement programme. By the end of 1990, a total of 51000 households had been resettled, each household receiving an average of 5ha of arable land. Zimbabwe does not have any natural lakes except for the wetlands at the headwaters of streams known as vleis or dambos. These water bodies, formed by the local schists deposits, retain moisture because of their spongy vegetation and feed the streams even after the rains stop. However, the vleis and dambos have little fishery development potential. Fisheries resources consist of rivers, large dams (large reservoirs), small dams (small reservoirs) and the commercial aquaculture ponds (Table2.1). Although the artisanal, small-scale fishing activities in the rivers provide a valuable source of protein for the communal population, riverine fisheries cannot play a major role in increasing the availability of fish in Zimbabwe. Most of the rivers and their tributaries, except the great Zambezi, do not retain water most of the year. Thus, the country has to rely almost entirely on man-made water bodies such as reservoirs and ponds for fish yield optimization. Almost 90% of the country's fish production is obtained from Lake Kariba, the huge man-made lake in the Zambezi which is shared by Zimbabwe and Zambia. Catch from the reservoir amounts to 10 000 t, of which 93% is the transplanted Tanganyika sardine (Limnothrissa miodon) locally called kapenta. Reservoirs such as Kyle, Robertson, Chivero and Bangala mainly produce indigenous bream. There are a number of commercial aquaculture farms in the country which produce trout and bream on an industrial scale. Forty-one major reservoirs are listed in Table 2.3. At least seven of these reservoirs have a surface area of more than 1000ha (see Table 2.2). Southern Africa has a particularly high concentration of SWBs which attracted the attention of both researchers and developmental agencies as these water bodies can play a vital role in nutrition and food security in the region. The concentration, characteristics and importance of various types of water bodies covered under the SWBs differ from country to country even within the South African Development Community (SADC) region. In Zimbabwe, all man-made impoundments of less than 1000ha in area are generally referred to as small water bodies. The term "dam" is often preferred by the technical staff of Zimbabwe and FAO in their documentation to signify small water bodies/reservoirs. In many cases the terms "dams", "small water bodies" and "reservoirs" can be seen used interchangeably, as the small reservoirs constitute the bulk of small water bodies in the country. Of the estimated 12430 dams in southern Africa (excluding South Africa) covering an area of 126089 ha, 10747 (117 662 ha) are situated in Zimbabwe (Ersdal, 1994). Thus, 86% of the small water bodies and 93% of their surface area lie in Zimbabwe, which forms only 6.8% of the geographic area in the region. This high concentration of SWBs in the country can be related to the water resources availability and its seasonality in the country. Zimbabwe receives an annual mean rainfall of 266666 million m3, 7.5% of which is carried by the rivers. According to experts, this surface flow and ground water recharge, if utilized, would be sufficient for two to three times the present population even if the per caput consumption were to double in the next three years. However, the rainfall and surface flow are subject to extreme temporal and spatial variations and a high mean annual evaporation of 1200 to 1800 mm creates a water balance deficit throughout the year. While the eastern highlands receive a rainfall of 2 000 mm, precipitation over one-quarter of the land area in the country is less than 600 mm. With the dry season lasting seven months a year, the people of Zimbabwe have experience in dealing with local and temporary water shortages which, inter alia, includes impoundment of water in dams. Acute water crises are common especially during abnormal drought owing to the lowering of the water table and the desiccation of perennial streams. Because of accelerated runoff as a consequence of deforestation, rivers dry up sooner than before. Even the major rivers such as the Save or the Limpopo are reduced to isolated pools connected by trickles of water at the end of dry seasons. In view of this water resource crisis, the creation of small water bodies has become an essential part of the developmental activities in the country. A large number of small earth dams were constructed in the communal areas after the devastating droughts from 1982 to 1984. The average and median areas of small dams in Zimbabwe are estimated empirically as 16ha and 3ha respectively. Similar correlations have been established between the capacity and mean depth of small dams (Figure 4). Nearly one-half of the small water bodies in Zimbabwe are within the size range of 1-5ha (Table 2.4). Of the 10 747 small water bodies in Zimbabwe, 4 875 (61%) are situated in the privately owned commercial lands, used for cattle ranching, irrigation or aquaculture (this figure differs slightly with the AGRITEX database, which is based on GIS). The communal and resettlement areas, where the dams provide direct benefit to the artisanal and rural fishers, account for 39% of the dams and cover 40% of the total area. Dams of the communal areas are slightly larger in average size (Table 2.5). Details of water use are available on 8227 dams, 75% of which are meant for agriculture use. The urban water supply and government/institutional use account for 1.6% of the dams, while the industry and mines utilize the water of 0.5% of them. In many cases, the dams are put to multiple use, such as cattle watering, drinking water supply, domestic use and irrigation. There is a preponderance of dams along the highlands running across the country from the southwest to the northeast, comprising the provinces of Matabeleland South, Mavsingo, Manicaland, Midlands and the Mashonalands (Figure 5). The dry cattle county of Matabeleland South accounts for 23% (2243) of the 9818 dams listed in the AGRITEX database, followed by 17% in Midlands and 14% each in the East and West Mashonaland provinces. The dams in Mavsingo have the maximum capacity of 29%, followed by Midlands with 26% capacity (Table 2.6). In all the provinces, most of the dams are small with a capacity of less than 100000 m3. Dams with volume higher than 500000 m3 are very few (Table 2.7). Distribution of dams in 60districts of the country and the inventory of dams in the Mudzi district are given in Table 2.8 and Table 2.9 respectively. The ichthyofauna of Zimbabwe is believed to have originated from the southward migration of the tropical species from the Zaire and Nile river systems. Bell-Cross and Minshull (1988) traced the origin of the fish fauna to the equatorial river systems. With the exception of a genus of fish restricted to the streams in Lesotho (Oreodaimon) and two genera (Sadelia and Galaxias) isolated in the southern cape, there are no genera of fish present in southern Africa that are not found in the Zaire and Nile river systems. It is believed that fish from the equatorial regions made a series of southward migrations into the Zimbabwean river systems. However, survival of these species became difficult owing to the great drops in temperature and possibly the habitat destruction associated with the drier climate. River beds in most of the river systems in Zimbabwe are essentially rocky, providing little aquatic cover for small fish species or juveniles of the larger species. This adverse habitat accounts for the diminished fish species diversity of southern Africa in general and Zimbabwe in particular. The present ichthyofauna of Zimbabwe and the neighbouring areas is believed to include those relic species which managed to survive in certain patches of favourable habitats. Creation of man-made lentic environments on the river courses in recent years has added a new dimension to the distribution of fish species. Weed beds in these new lacustrine environments provide hospitable habitats in which the fish thrive. For instance, many Upper Zambezi fish species have successfully colonized Lake Kariba after getting washed down through the Falls or entering the lake inadvertently during the stocking of tilapia collected from the ponds of Chilanga in Zambia in the late 1950s. Similarly, the thousands of small dams in the country provide habitat protection for a number of species both endemic and alien to the system that would not have survived otherwise. The fish fauna of Upper Zambezi, Middle Zambezi, Pungwe, Save and Runde varies as it derives from different sources in the tropics. While the Zambezi, Okavango and Cunene rivers were populated by the Kasai river, a major tributary of the Zaire, the Zambezi below the Falls and other east-flowing rivers derived their fauna from the Nile and the Lualaba, the great southeastern tributary of the Zaire. The fish species spectrum of Zimbabwe is not very rich. There are 132 species recorded from various river basins in the country, including ten exotic species, against an estimated 3000 species of freshwater fish reported in Africa, 600 in the Zaire system and 360 in the Zambezi river system including Lake Malawi (Bell-Cross and Minshull, 1988). The fish of Zimbabwe belong to 14 orders, 28 families and 60 genera. Cyprinidae, consisting of 41 species of which 26 are Barbus, are particularly rich in species diversity. The virtual absence of clupeids, except for Limnothrissa miodon, the exotic species of Lake Kariba, and the low species number of the schilbeid (2) and Bagrid (3) catfish are notable. The fisheries of small water bodies and the commercial aquaculture of the country are based on a very limited number of species. The indigenous species harvested from the small dams and rivers include Oreochromis macrochir, O. mossambicus, Tilapia rendalli, Clarias gariepinus, Barbus marequensis, Labeo altivelis and L. congoro. These seven species along with two exotics, i.e. Limnothrissa miodon of Kariba and Micropterus salmoides of other dams, constitute the commercial fish fauna of Zimbabwe. O. mossambicus, T. rendalli and C. gariepinus are used in aquaculture along with two introduced trout species, Oncorhynchus mykiss and Salmo trutta. The six species that virtually constitute the economically important fish in the small water bodies are the following. (Oreochromis mossambicus) Mozambique bream: Being a typical omnivore, it feeds on plankton, algae, insects and their larvae, vegetable matter and a variety of grains and seeds. It is a mouth breeder and the males make several saucer-shaped nests in the sand in fairly shallow shores where they try to attract the females. Several spawnings occur during the summer, starting in September. The fry are guarded by the females by keeping them in the mouth. O. mossambicus is widely distributed in the country and considered the most important species in net fisheries of the dams. (Oreochromis macrochir) Green-headed bream: A specialized phytoplankton feeder, it consumes large amount of algae. It reaches a maximum weight of 2 kg. (Tilapia rendalli) Red-breasted bream: Basically a herbivore, the red-breasted bream feeds on almost all kinds of aquatic plants and can completely eliminate vegetation in dams and ponds. It is also known to feed on plankton, aquatic larvae and small fish. It is not a mouth breeder. Both the parents fan the eggs with their fins and guard the nests. This species and Serranochromis robustus tend to see the gillnets and avoid them. (Clarias gariepinus) Barbel: A predatory catfish, the barbel has a wide feeding range including fish, frogs, shrimps, aquatic larvae, insects, birds and even crocodiles. The fish is also known to feed on grain seeds and fruit berries. Though it can grow to 30 kg in weight, such specimens are very rare. During the rainy season, the fish move up the river to lay eggs on vegetation of the flooded areas. They do not guard the eggs or fry. An air-breathing fish, it can survive in muddy unoxygenated waters and even move short distances over land to reach new water sources. This land migration helps the fish in its survival and distribution and makes it ubiquitous in ponds and dams all over the country. It is an important fish in gillnet fisheries. (Labeo cylindricus) Mud sucker: Most of the Labeo spp. feed on detritus and vegetable matter at the bottom. The mud sucker, though common, does not get caught in the gillnets owing to its small size. (Barbus marquensis) Yellow fish: This fish feeds on aquatic insects and larvae, shrimps, molluscs, insects and small fish. It migrates upstream to spawn during the rainy season and reaches a weight of 3 kg. Although caught in gillnets, it is not very common. B. paludinosus is too small to be caught in gillnets. AGRITEX conducted a fish stock survey of 100 dams from 1983 to 1992 by employing gillnets (>51 mm stretched mesh) and 20 mm seines (van der Mheen, 1993). The survey revealed that 60% of the dams on the Lake Kariba catchment and 100% of the middle Zambezi catchment harboured O. mossambicus. This fish is extensively stocked by AGRITEX throughout the country and therefore enjoys a wide distribution. O. macrochir exists naturally in the rivers of upper Zambezi and is transplanted to other river systems. Clarias gariepinus and Labeo cylindricus were also found to be present in most of the dams in different river basins of the country (Table2.10). L.altivelis is confined to the dams of the Lake Kariba drainage as it does not appear to have succeeded in colonizing the other river systems. Almost all the small reservoirs are formed by erecting earthen dykes across seasonal streams to store water for cattle ranching, drinking water supply, and irrigation. While the larger reservoirs sustain commercial and artisanal fisheries of some significance, most of the smaller ones are fished mainly for subsistence, with 50% of the fish being caught by women. Despite the overwhelming importance of the small water bodies in the fisheries development of Zimbabwe, exploitation of this resource remains essentially unorganized resulting in inadequate documentation of the fish yield and catch composition. Many small water bodies dry up in summer and have very poor fish stock or produce very little fish. In many cases, especially in the communal areas, the reservoirs are managed on the basis of a common property norm, allowing unrestricted access to the resource. In the absence of effective scientific management, a subsistence or casual fishing operation employing traditional gear is in vogue. Various estimates put the fish yield from small water bodies at 6000 to 12000 t/yr. The fishing methods practised in the small water bodies are (i) artisanal fisheries; (ii) gillnets; and (iii) other unauthorized fishing practices. The traditional artisanal fishing gear  the rod and line  is the most popular fishing gear used by men, women and children in the rivers and dams. Since no licence is needed to use the rod and line, this gear is greatly used in small dams, especially those situated in the communal areas. The bulk of the fish harvest from the small dams comes from using the rod and line fishing method. It was estimated (van der Mheen, 1993) that on average 20 fishers fish in a dam every day using the rod and line, each catching about 400 g of fish per fishing day (4.5 hrs) for home consumption. The annual yield from the rod and line fishing method at a 20ha dam was estimated at 3000 kg. People living in the communal areas are mainly engaged in rod and line fishery and the mean distance from the homes to the dam is less than 3 km. The main species caught by rod and line are bream (Oreochromis spp. and Tilapia spp. ), mostly juveniles weighing approximately 10 g.
The artisanal fishing implements designed by the rural community and made of locally available materials are used extensively in the country. 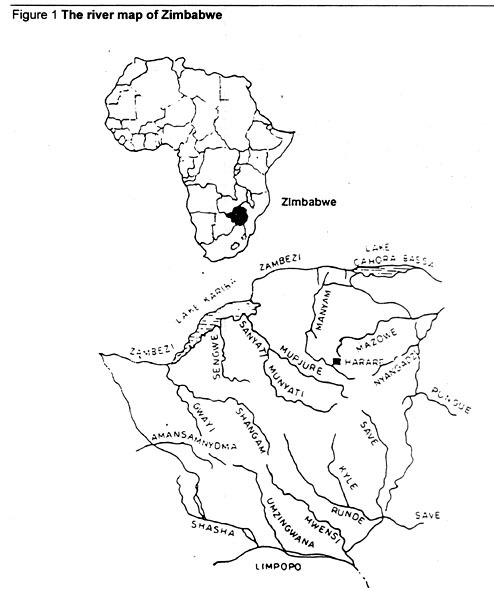 Chimbuya (1993) described the traditional fishing methods used in small reservoirs in Zimbabwe based on the observations made in the Mwenje and Mufurudzi dams. There are basically two categories. Gear used to restrain the fish from escaping include: Kamukore, a modified scoop net; Javu, the cast net; Chigubhu a plastic bottle trap; and, Chirauro, the hook and line. Fishing methods employed to catch fish include: Kamukodobo, a depression made in the soil to lure fish; and, Kagadheni, a reed enclosure fitted with a trap door. Different types of artisanal fishing gear are described below. Kumukore is a cross between a cast net and a seine net and resembles a Polynesian rectangular net made by tying a net between two wooden poles. A rubber band is stretched in between the two poles and the net in such a way that the net sags in the middle. Kamukore is used to scoop out fish after luring them into shallow areas by bait made of crushed maize or left-over sadza (thick porridge). This is a favourite fishing gear of men, both young and old, used mostly during the late evenings and the night. Catches are good during the warmer months because of the increased feeding activity during this season. Javu is a typical cast net of 1m radius fitted with weights along the periphery. Fish are usually entangled or gilled depending on the mesh size. Chighubhu is an improvised fishing trap made of an empty plastic container of a two-to-five litre capacity. The trap is tied to a long rope which helps in retrieving it from the water. The trap with some bait inside is left in the water for an hour or so, and then pulled out. The Chighubhu is used throughout the year and the catches are better when temperatures are high. Test fishing data indicated that shallow bottom beds with some vegetation are perfect spots for operating bottle traps. O. mossambicus are ideal fish to catch with bottle traps. Oreochromis mossambicus, Barbus paludinosus, B. lineomaculatus, B. unitaeniatus, Clarias gariepinus, Labeo cylindricus and Tilapia rendalli are the fish commonly trapped in the Chighubhu. Chirauro is the traditional hook and line, made by tying a long line to the end of a simple reed or a long stick. It is one of the most popular traditional fishing gear operated by men, women, and children. Hooks of different sizes are available in the local market and are selected according to the target species. Sometimes a single line may bear more than one hook and each one is baited with sadza, a worm or an insect. Masaga is a piece of cloth, a bed sheet or a sack cloth (usually made of old maize bags), used as a seine net. Two persons operate the net by dragging it along the shore to catch small fish, especially the juveniles of Oreochromis spp. This method is reported to be very popular among the women. The use of masaga is more common during the rainy season when river waters are muddy and fish cannot see fishers. Kumukodobo is a depression made in the soil at the shallow bottom with a narrow opening. The pit is baited to lure fish, mainly the small species, through a narrow opening. As soon as the fish enter the pit, the opening is closed and they are removed by scoop nets. Kagadheni is an enclosure made of reeds placed in shallow waters. It is baited and has a small trap door to let fish into the enclosure. A long string attached to the door facilitates easy closure when the fisher feels that the fish have entered the enclosure. The whole structure is pulled out of water when the fish are trapped. Kagadheni is pulled out every hour when the catch is good. Some authors estimate that the catch from traditional fishing gear is as much as that from gillnets. In Mwenje dam, ALCOM has estimated a catch of 500 g per person per day from fishing using chirauro (hook and line). One hundred people fishing every day catch about 50 kg of fish. At the rate of 200 days a year, they would catch a total of 10 t of fish. Assuming that the entire catch from the use of all traditional gear is 30t of fish per year, this would be equivalent to 60kg/ha/year out of the total of 150 kg/ha/year. The hook and line catch of 22 dams in the size range of 6-100ha is estimated at 93g/hr/fisher, equivalent to 146 kg/ha/yr (see Table 2.11). The use of gillnets is not allowed in the rivers in Zimbabwe, while its use in dams is subject to a number of restrictions. A licence, which is renewable annually, is needed to own, buy, or sell a gillnet. The licence specifies the dimensions of the nets, their mesh size, and the dams where they can be used. Since legal gillnets frequently come in the stretched mesh sizes of 76 mm (3 in), 102mm (4 in) and 114 mm (4.5 in), they are used to catch large-sized fish such as Oreochromis mossambicus, O. macrochir and C. gariepinus. Apart from the traditional fishing methods and legal gillnetting, a number of other fishing implements are used by the people which are not permitted under law. The use of unauthorized, and often irrational fishing methods, is a matter of concern for the fishery managers as well as the environmentalists. The use of these methods can lead to irrevocable damage to the fish stock and the species diversity. Small-meshed gillnets, shore seines and dipnets made of mosquito mesh are used by the poachers to extract fish from small reservoirs. The fish catch from small reservoirs is not estimated to any reliable extent, except in a few case studies which are not representative considering the variety of dams available in the country. As a result, the fish production and yield from this resource remain unknown. In Mwenje dam, ALCOM has estimated a daily catch of 500 g per person from rod and line fishing. On the basis of 100 people fishing for 200 days a year, the annual catch from this gear was estimated at 10 t. Assuming that the other types of traditional fishing gear (including the illegal ones) are used to catch another 20 t, the total fish catch of the reservoir was estimated at 30t with a yield of 60 kg/ha/yr. Estimates of rod and line catches for 22 other dams in the size range of 6-100ha are also available, where between 6 and 37 people fish every day, catching from 3 to 225 g of fish per hour. On average, a fisher catches 400 g of fish during 4.5 hrs. This is equivalent to a mean yield of 146 kg/ha in the range of 17 to 329 kg/ha. Similar estimates are available with respect to the Mufurudzi dam in Shamwa district, where 100 people fish every day using the rod and line and catch on average 250 kg of O. mossambicus and T. rendalli. As fishing is confined to the warm months of August to April (270 days), a total annual catch of 6.75 t is estimated. Annual catch from the plastic bottle trap (duwo) from the same dam was estimated by ALCOM as 54 t a year. The rod and line fishers prefer Oreochromis mossambicus, O. macrochir and Tilapia rendalii and they usually catch the juveniles of these species. Label spp. and Clarias gariepinus are the next preferences. AGRITEX maintains a gillnet fish catch database at its Fisheries Unit at Harare. The basic input for the database is a daily catch record form to be filled out by the fishers. The daily record maintained by the field staff of AGRITEX at the dam site contains information on the fish caught in gillnets by species, number and weight. Apart from the general information on the fishing group and the dam, the lengths of nets and their mesh sizes are also recorded. The district office generates the monthly and annual summaries from this baseline data, enabling identification of the trends and formulation of necessary extension activities. However, owing to the reported poor response from the field units of AGRITEX, the catch database remains rather incomplete. The annual catch of eight dams as extracted from AGRITEX catch database is given in Table 2.12. Gillnets are highly species-selective gear. Use of the mesh size >76 mm (stretched) is permitted by the Department of National Parks and Wildlife Management (DNPWM) to catch fish within a narrow range of species. This mesh size is used to catch O. mossambicus ranging from 19 to 24 cm in length and weighing from 130 to 260 g. Van der Mheen (1993) reported that the use of gillnets in the Nyadire dam heavily favoured the catch of Oreochromis mossambicus (see Table 2.13). O. mossambicus and Clarias gariepinus together constitute more than 90% of the catch in most of the small reservoirs in Zimbabwe. During the dam surveys of AGRITEX, seine net catches of Oreochromis macrochir were much larger than gillnet catches (Table 2.14). Size selectivity of gillnets in respect of O. mossambicus at a hanging ratio of 50% has been estimated by van der Mheen (1993) as: Sj = 0.173* exp (lj-l0)2/10.7 ; where Sj= selectivity of size class j; lj = total length of size class j; and l0 = optimum length. The optimum lengths of fish that can be caught with different mesh sizes used in small dams are compared with the actual field observations in Table 2.15. The main emphasis of fisheries management in the small reservoirs of Zimbabwe is on gillnet fishery which is still in its infancy. The stress is on organizing fishing groups in communal reservoirs and encouraging them to undertake legal fishing to ensure that conservation measures are followed. This entails either convincing the illegal fishing gear operators to follow the law or removing them from the site. Licences for the gillnets are issued by the Department of National Parks and Wildlife Management (DNPWM) based on advice from AGRITEX. The field staff of AGRITEX in collaboration with the district councils handle the identification and selection of fishers. Before giving technical advice to the DNPWM regarding the mesh size and quantity of fishing nets to be used in a dam, AGRITEX conducts a detailed dam survey to assess the fish stock and determine both the feasibility of commercial fishing in the dam and the amount of fishing pressure to be allowed. The licence specifies the dimensions of the nets, their mesh size and the dams where they can be used. Since the legal stretched mesh sizes of gillnets are usually 76 mm (3 in), 102 mm (4in) and 114 mm (4.5 in), they are used to catch large-sized fish such as Oreochromis mossambicus, O. macrochir and C. gariepinus. Two types of fish stock surveys using gillnets have been conducted in Chindunduma, Chimhanda and Sebakwe dams by ALCOM and AGRITEX. The ALCOM surveys were based on the Drottingholm method of employing multi-mesh monofilament gillnets with stretched mesh sizes of 12.5, 16, 20, 25, 33, 44, 50, 60, 66, 76, 86, 100, 120 and 150 mm. The twine diameter varied from 0.1 to 0.12 mm. Fourteen panels of nets of different mesh sizes, each measuring 3m x 1.5 m, were randomly arranged in the net with a total area of 63 m2. Nets were employed at different depths depending on the depth of the water column. The experimental gillnets of AGRITEX comprised 45m long, 20-meshes deep gillnets made of 6 ply twine, mounted at a 50% hanging ratio. The mesh sizes tried were 51, 64, 76, 89, 102, 114 and 127 mm. One mesh size was tried every day at the bottom and on the surface. The 18 species caught in gillnet experiments were Oreochromis mossambicus, O. macrochir, Clarias gariepinus, Serranochromis robustus, Tilapia rendalli, Labeo cylindricus, L. altivelis, Brycinus imberi, Barbus marquensis, B. trimaculatus, B. radiatus, B. paludinosus, B. lineomaculatus, B. unitaeniatus, Mesobola brevianalis, Micralestis acutidens, Marcusenius macrolepidotus and Mormyrus longirostris. Among them, Oreochromis mossambicus was found to be the most important fish to be caught by both methods used in Chindnduma and Chimhanda dams. In Sebakwe, Labeo altivelis followed by Barbus paludinosus were caught in large numbers. The presence of all sizes, particularly the larger ones in the length frequency analysis, proved that O. mossambicus were not heavily exploited in these dams. Sebakwe dam, by virtue of its age and the heavy stocking done in it over the years, harboured a good variety of fish species. Labeo altivelis followed by Barbus paludinosus were the important species in this reservoir. The gillnets are officially allowed only in those dams where the fishing groups have been identified by AGRITEX and DNPWM. A number of fishing groups can be licensed for fishing with gillnets in a dam. In Manyuchi dam, six fishing groups have been issued licenses. Five of these groups, i.e. Tangenhamo, Madziva, Tagona, Tinechido and Chisungourasha, are presently operating. To date fishing groups have been identified only in 50 dams and licences have been issued to 139 fishing groups but not all of the groups are fishing. While AGRITEX is focusing its attention on organizing fishing groups in many dams, the process of bringing more and more dams under effective gillnet fishing is not gaining the required momentum. There are many deterrents to the growth of gillnet fishery. The licensing procedure is cumbersome and riddled with procedural delays. The time lag between the application for licence and its final issuance can be very long owing to the delay in survey procedure and the long interdepartmental correspondence involved. The long licensing procedure and the yearly renewal regulation impede the wide use of this gear. There is a stipulation to buy the equipment (nets, ropes, floats, weights) and boat at a cost price of $Z1 100 without any loan or subsidy from the government, but very often the catch is not remunerative enough to match this investment. The following criteria are followed by the AGRITEX in identifying a fishing group. 1. The group must be supported by the community. Without community support, poaching cannot be prevented. 2. The group should include members with fishing experience. 3. The group should be cohesive, financially sound and ready to invest money and manage their finances well. 4. Fishing should be the full-time activity of the group. 5. All fishing groups are advised to keep their operations small and not to invest in freezers, transport, or other capital intensive investments. All of these conditions are seldom met. A survey conducted by AGRITEX on the performance of 24 fishing groups in 22 dams, indicated that only seven of them performed well (Table 2.16). The undervaluation of catch by the groups is quite commonly reported, mainly because many of them use illegal small-meshed gillnets. 8 Wrong gear, stopped fishing. 15 Competition among group members. Small mesh. 15 Group members are outsiders. They are stopped by local poachers. 10 Group concentrated on C.gariepinus only. 30 Performed well. Some members left. 50 Very low catches, lost interest, stopped fishing. 3500 Some groups perform well. In some all members are not fishermen. 30 Due to fear of theft, nets used as Seine nets. 50 Competition with other licensed fishermen. 400 Fishing good. Some internal problems. 10 Fishing good. Some internal problems. 25 Perform well. Some problems with poachers. One of the decisive steps taken by the government in promoting the fisheries of small water bodies is the effort made towards restocking the dams. Zimbabwe experienced one of its worst droughts in the 1991-92 season, when many of the perennial dams went dry, thereby completely eliminating the populations of bream and other commercially important fish species. Consequently, with the assistance of FAO's Office for Special Relief Operation, a stocking programme was initiated for building up populations of desirable species in the dams. The stocking was done in two phases (February-June 1993 and October 1993-June 1994) as the fish were not handled during the winter. When selecting dams for stocking, priority was given to those that did not normally dry up but did so during the drought of 1991-92. Out of a total of 1356 dams which had dried up and needed restocking, 838 of them were stocked. The stocking material was collected from the natural stocks of dams that had not dried up. Being the major species of fish present in the dams of Zimbabwe, O. mossambicus accounted for 80.5% of the total fish stocked. This was followed by Tilapia rendalli (10.1%), O. macrochir (9.0%) and a small quantity of Tilapia sparrmanii. A total of 280000 fingerlings of 16 g (average) were stocked in the reservoirs, making the total weight of the stocked fish 4.5 t.
1. The migrating species were absent, and only stocked species were found. This situation was explained by the fact that restocking was successful and was done on a dam which had dried up and refilled. 2. The migrating species were found in small numbers, and no tilapia other than the stocked species were present. Here restocking was successful. The dam had spilled. 3. The migrating species were abundant, and the abundance of the stocked species was much higher than in reservoirs (1) and (2). Restocking was more successful and the dam had spilled. 4. As in (3) but also non-migrating and uncommon species were found. The dam did not completely dry up, though restocking might have been necessary. 5. Fish species were present but not the restocked species. The restocking was not successful as the restocked species had failed to reestablish. 6. No evidence of the presence of fish was found in the reservoirs. The dam dried out after restocking. Restocking was therefore unsuccessful. Taking the first four (1 to 4 above) conditions as criteria, the success of the stocking operations was rated at 76%. This could have been higher, were it not for the drying up of dams for a second time after restocking. In some cases, stocking was not successful because of the failure of the stock to reestablish or the fish seed had a high mortality rate because of handling stress, especially when translocated over long distances. Institutionalized community-based management is not common in Zimbabwe, although most of the water bodies are considered by the local community as common property with free access. The villagers use a variety of artisanal and improvised fishing gear, disregarding many government restrictions, which often leads to overexploitation of the fish stock. The fishers are either unaware of or not impressed by the basic tenets of conservation and sustainable yields. The government finds full enforcement of the regulations almost impossible owing to the high cost involved in policing all the small water bodies of the country. It is also difficult to justify a huge allocation for this purpose from the limited resources of the government. At the same time, the significant role of the small water bodies in providing the much-needed food security for the rural poor cannot be ignored. In this context, the community-based management approach formulated and tried by ALCOM (Chimbuya and Ersdal, 1994) assumes significance. Totally distinct from private or state-mediated management, it envisages full participation of the local community in the management process. Under participatory community management, all decisions are made by the representatives of the community with the assistance of the relevant technical government departments, non-governmental organizations (NGOs) or international organizations. ALCOM has assessed the potential strength of the community-based management approach in fostering a meaningful fishery development in community dams through a series of Rapid Rural Appraisals (RRA) conducted in Chichewo, Taru, Mufurudzi, and Mwanje dams. Eventually, community-based management was tried in Mwanje and Mufurudzi with remarkable success. Under the existing setup, the District Council (an administrative unit of the country) creates the Natural Resources Committee (NRC) which is responsible for decision-making and the enforcement of regulations governing the conservation and utilization of natural resources. The NRC, composed of all the ward councillors and one non-councillor member, employs rangers who enforce regulations. At the village level, the ward councillors work with the Village Development Committees (VIDCO). However, fisheries resources are not included in this arrangement as they come under the purview of the DNPWM in collaboration with other government departments. The Research Division of DNPWM draws up fish conservation regulations in collaboration with its Management Division which is responsible for the enforcement of management measures. The Research Division conducts the fish stock assessment in collaboration with AGRITEX. The decision-making in reservoir fisheries management is shared by the DNPWM and the District Council. While DNPWM decides the quantum of the fishing effort and the mesh sizes, the District Council identifies and decides the number of fishers. The RRA conducted by ALCOM found that the existing arrangement left much to be desired. There was no single authority that coordinated management of fisheries resources at the district level. At the national level, the Research Division of DNPWM was responsible for making management decisions, but had no role in enforcing them. They had no authority to obtain catch records from the fishers who took advantage of the situation and did as they pleased.